Sonic Rush is set up well. It's a game that's easy to pick up and play (rush through the level) but difficult to master (maxing out the trick score). The download timing is quick considering that a whole level is being downloaded. When downloading the demo, the guest has the benefit of a progress bar that is constantly updated with the demo's download status. For some reason, the host is not granted that luxury. When the game powers up, there is a three-choice main menu. One of those choices is "Battle Play", the basic Vs Play mode. It's easy to find, easy to set up, and includes pop-up warnings before external (wireless) connection is established. The "Download Demo" mode is also easy to set up and includes pop-up warnings before external (wireless) connection is established, plus the guest's download status update bar. The "Download Demo" mode is located under the main menu "Options" tab - not where someone might look for it, especially considering it's not mentioned on the package. The menu fields are, however, large and accurate. Gameplay on Sonic Rush was handled very well. Controls are the same as the single-player experience, which has excellent controls. Pick-up-and-play is easy, with duplicate buttons for accuracy (when playing a game where speed is one of the primary factors, not having to stop and look at the controls is a boon). Tricks are tricky to master, as they should be, and the game's pace keeps up with a consistant, appropriate pace. Sonic Rush's look is classic to the Sonic series of games. While not fully 3D, the game uses 3D elements in a 2D world, creating a gaming experience that looks good while being fun and paying homage to its predecessors. The game's sound is good, adding to the play value while not detracting from the fun. If you want to turn off the volume, it won't kill you, just remember to pause the game first. While the single-player game itself doesn't have many feature options (it is a platformer after all), it would have been nice to have more than one choice of levels for the demo. One of the original intents for the Single-Card Download play feature is to give the guest(s) a sampling of what the game is like. It's supposed to give them a sense of what they'd get if they bought the game while, at the same time, trying to sell them on the fact that their money should go to that game above others currently under consideration. Some games, such as Over The Hedge and Madagascar have SCD content that has absolutely nothing to do with the main, single-player gaming experience. Sonic Rush, on the other hand, is not only like the single-player gaming experience, it uses the exact same levels. In the "Download Demo" mode, you're given a level to play through that is a replica of one from the main single-player game. They selected an appropriate level - there are no weird surprises, it wasn't the most difficult level in the game, and it is done in classic Sonic style. Unfortunately, since there is only one downloadable level, the replay factor is low (after playing through the level a few times, there won't be much more to it). In the "Battle Play" mode, there are a few different playable levels. The heart and spirit of the Sonic games, and the aspect that differentiates them from other platformer games is its emphasis on speed. As such, the game's designers did the intelligent thing and have you race, allowing you to see both characters' locations. The same perils and pitfalls are available to both players and feels, once again, just like part of the game. The only way that the "Battle Play" mode is lacking is that each player only has one screen for their character, instead of both, but this really can't be helped in a two-player version. A four-player setup with each player getting half of the upper screen for both of theirs would still give the taller screen, but would shrink the characters. Sonic Rush was one of the best Nintendo DS games when it first came out. Sonic Rush is still one of the best Nintendo DS games now. Sonic Rush may also be the best original Sonic game from the last decade (but that is, of course, always a matter of each person's opinion). The "Download Demo" mode is good (a bit lacking in choices, but a nice surprise for a game of this type), the "Battle Play" mode is great, and this game will hold up to the test of time. Hopefully, we'll get a sequel from the same designers, and soon! Display the download status bar for the Demo AND Battle modes and make it available for all players to see. Allow for a selection of downloadable levels for "Download Demo" mode. Include a downloadable training level that is enemy-free. Program a 4+ player Single-Card Download tricks competition. 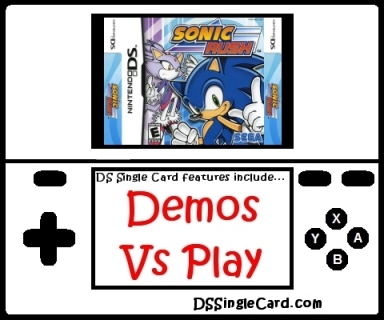 Click here to return to the DSSingleCard.com Sonic Rush profile.